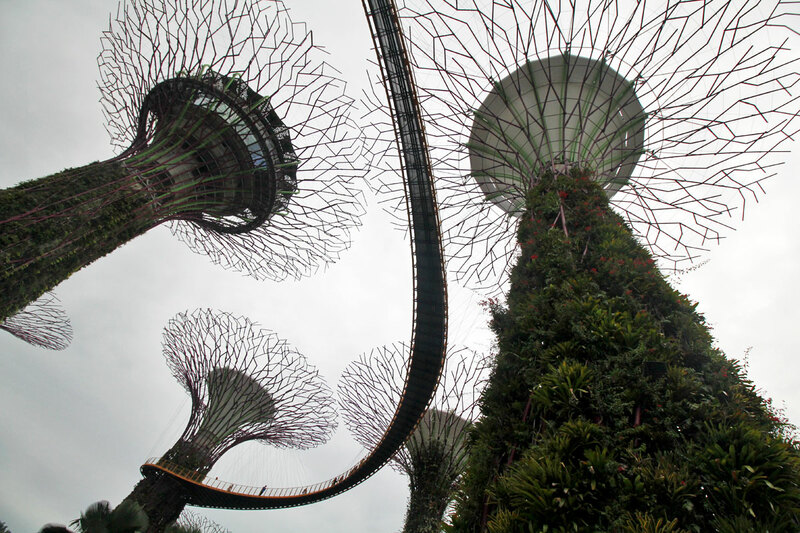 I don’t remember when or where I first learned about these Supertrees. I don’t know if I saw them on a website or on TV, but I do recall being blown away by them. Who wouldn’t be? They’re nothing short of spectacular. 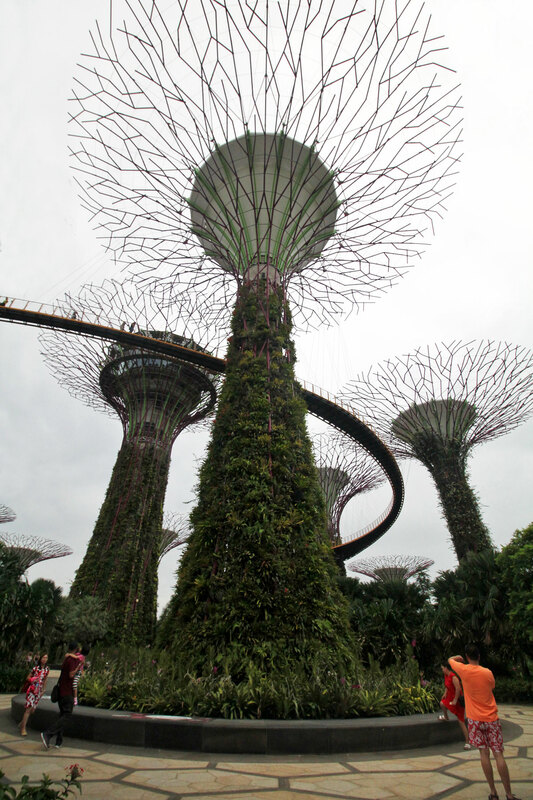 Towering over the ground at 25-50 meters tall, these futuristic cyborg trees of circuit and vine are unlike anything I’d ever seen. 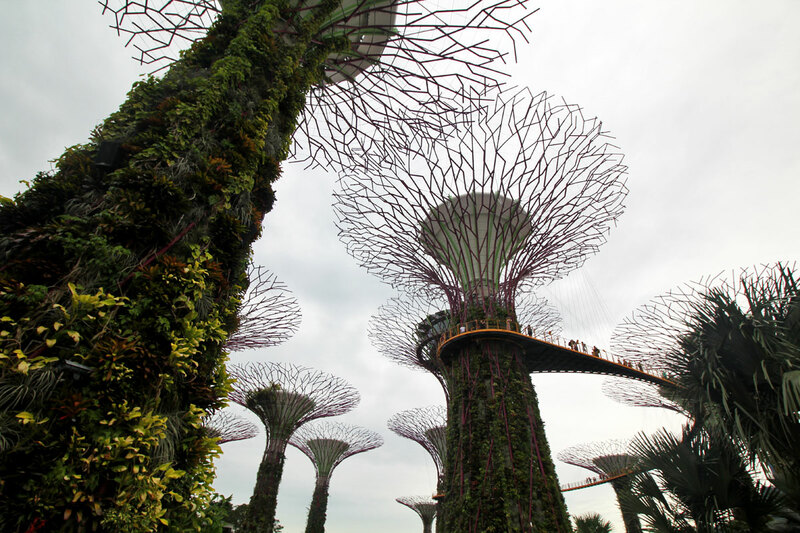 Like its neighbor the Marina Bay Sands, the Supertree Grove at Gardens by the Bay has become one of the most iconic and recognizable attractions in Singapore, and it isn’t hard to see why. Apart from looking uber cool, they serve some pretty interesting functions as well. A perfect storm of nature and technology. 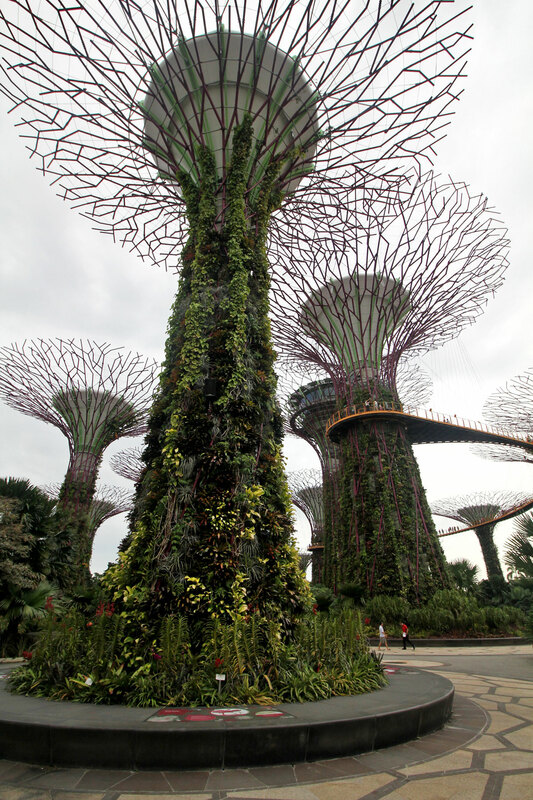 There are 18 Supertrees in all at Gardens by the Bay, 12 here at the Supertree Grove. It was an overcast day when we went so I apologize for the doomsday-ish feel to the photos. 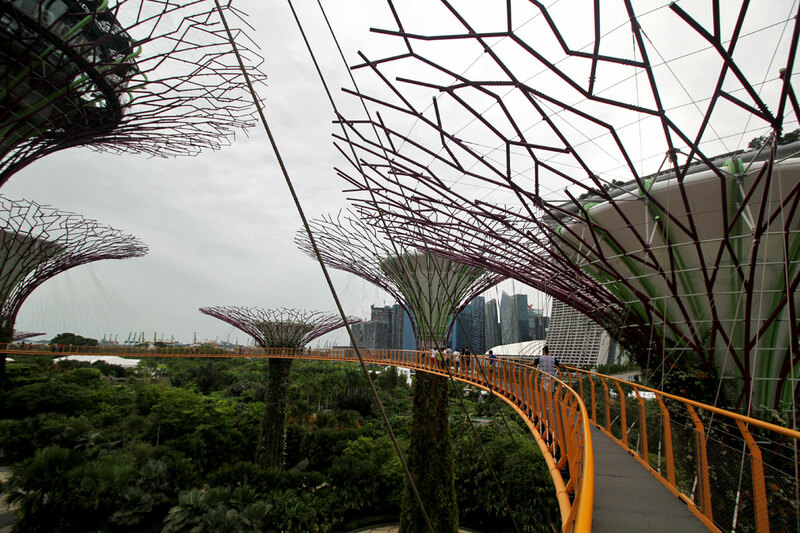 😆 Entrance to the Supertree Grove is free. 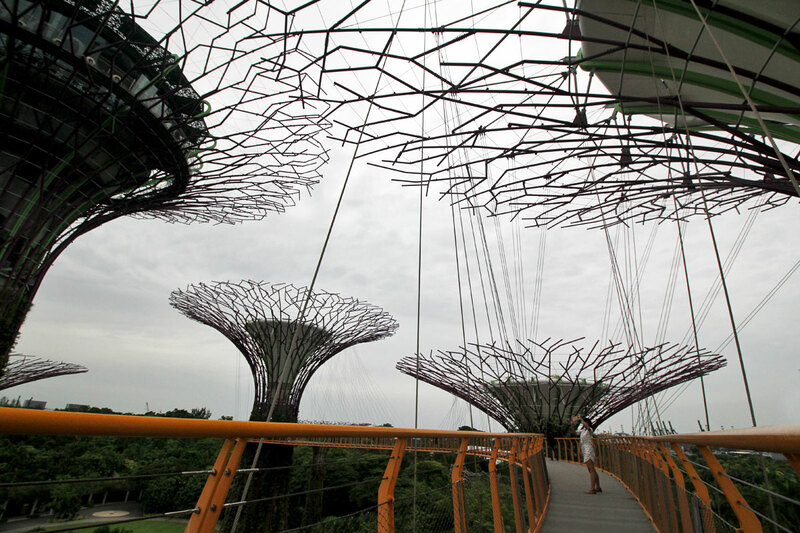 Two of the Supertrees are connected by this fun 128-meter aerial platform known as the OCBC Skyway. More on that later. As described in my post about the Flower Dome, I’m fascinated by Madagascar baobab trees and that’s exactly what these Supertrees remind me of. With their thick trunks and network of thin neuron-like branches, I wouldn’t be surprised if they were inspired by them. 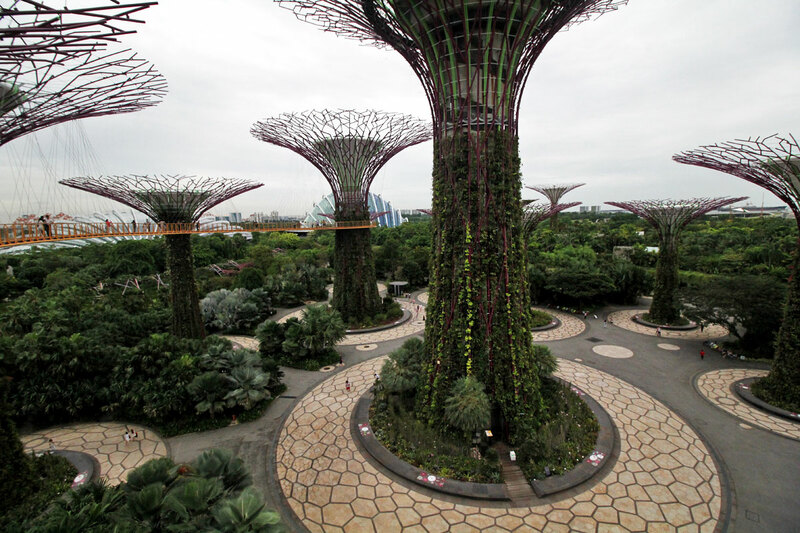 Over 162,900 varieties of bromeliads, orchids, ferns, and tropical flowering climbers have been planted on the Supertrees. With a heart of circuitry under a skin of leaf and vine, they really are like cyborg trees. 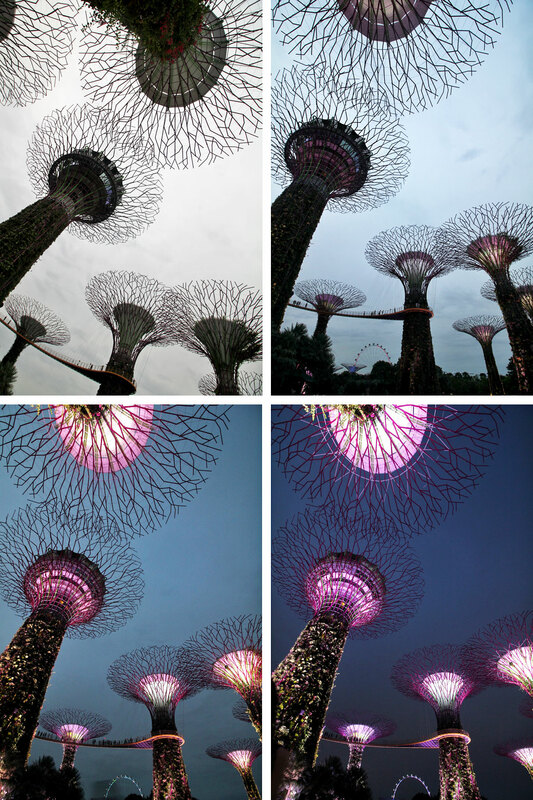 It’s amazing, no matter where you stand, you can’t help but take a good picture of the Supertrees. They’re spaced perfectly so every picture taken from the ground like this looks interesting. There’s Marina Bay Sands in the corner. If you think they look cool now, wait until you see them lit up during the Garden Rhapsody light show. 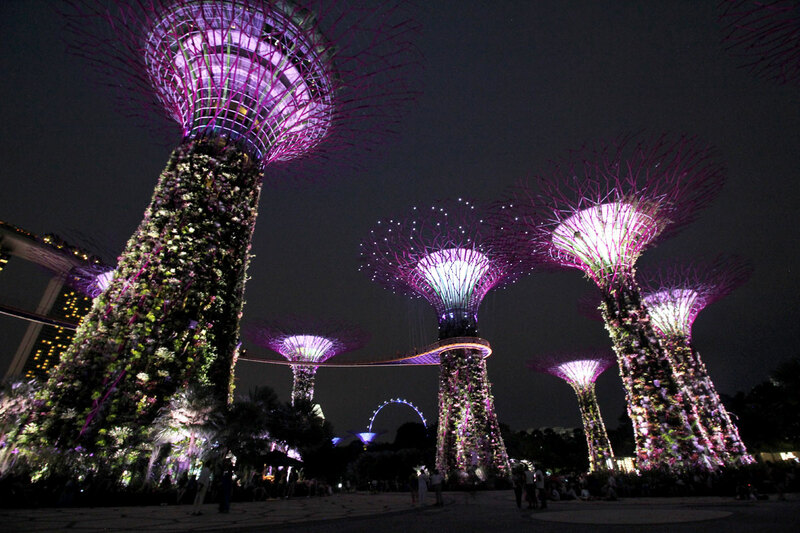 The Supertrees come alive twice a night to the tune of 70s disco music! Video at the bottom of this post. 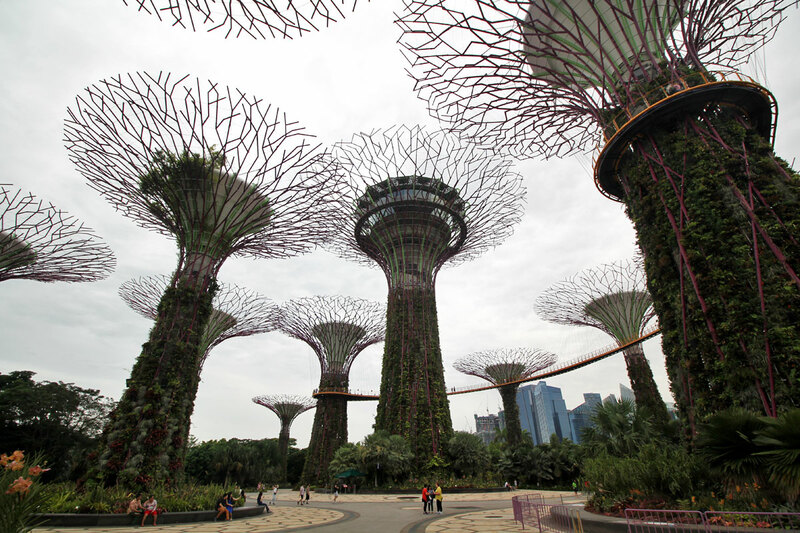 Entrance to the Supertree Grove is free but access to the OCBC Skyway is SGD 8 for adults and SGD 5 for children ages 3-12. It’s worth it. 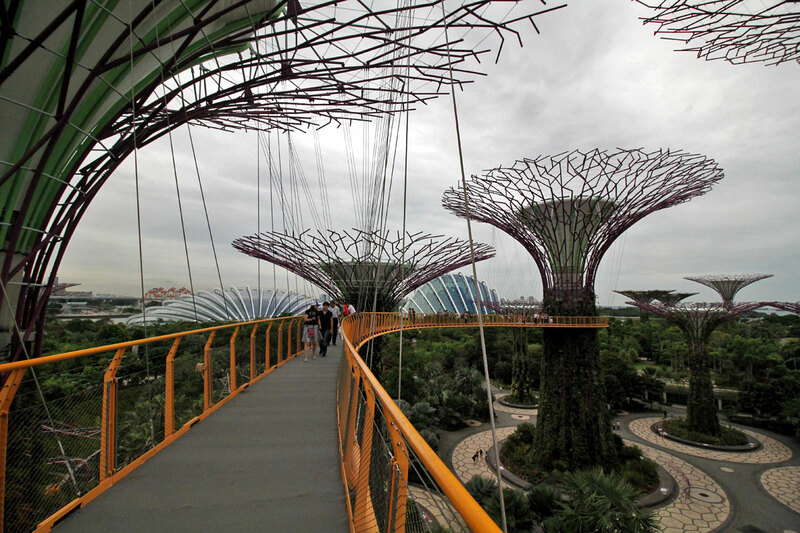 The walkway is suspended 22 meters above ground. For your safety, they have specific rules here like no running, high heels, etc. The Skyway can only accommodate so many people so everyone is allowed a maximum of 15 minutes. Some nice views from up here. There’s the Cloud Forest and Flower Dome just beyond the trees. Smile Reneelicious! I love the orange-y yellow they used for the Skyway. It really pops in pictures. Dark clouds brewing, but thankfully it didn’t rain. As an added safety precaution, they’ll ask everyone to come down at the slightest hint of rain. Unfortunately, you won’t be able to go back up again to use the rest of your time so be sure the weather is fair (enough) before purchasing a ticket. The Skyway is open until 9PM so I guess you can watch the Garden Rhapsody light show from up here. Must be pretty awesome! 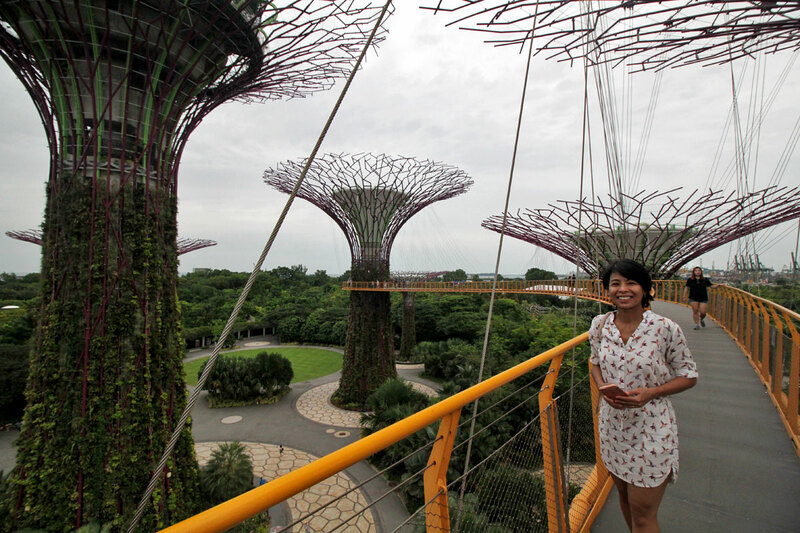 At the top of the tallest Supertree is a restaurant and rooftop bar. Entrance to the latter is SGD 18 per person which includes one complimentary drink. Ren had a cocktail while I enjoyed a beer. There are sofa cushions and tables all along the perimeter so it’s a nice place to chill out while waiting for the light show. This central Supertee is 16 stories tall, giving you the best unobstructed views of the Grove. And here we go! See that central Supertree lighting up? 68 independent audio speakers are used during the show to simulate “live” musicians performing at various spots. “Boogie wanna dance!” 😆 The Supertree Grove turns into an electric 70s disco hall during the light and sound show. 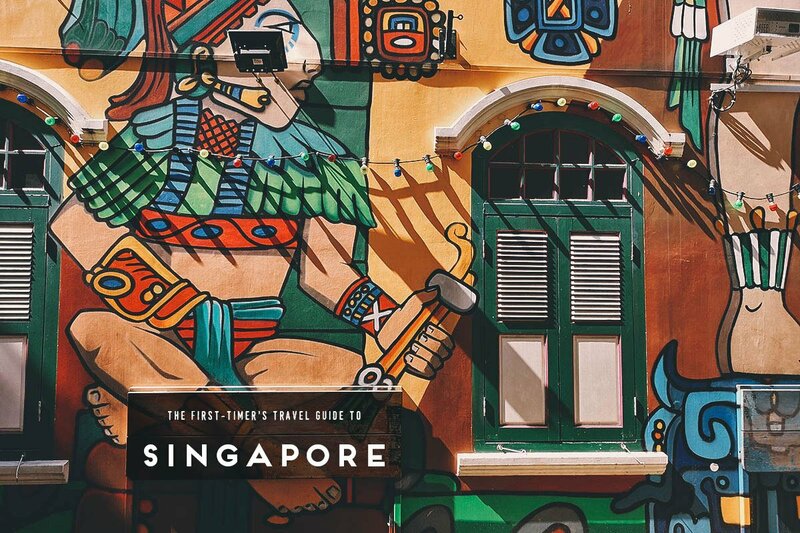 It was created by award-winning lighting designer Adrian Tan and one of Singapore’s most sought-after music composers and arrangers, Bang Wenfu. Groovy baby! 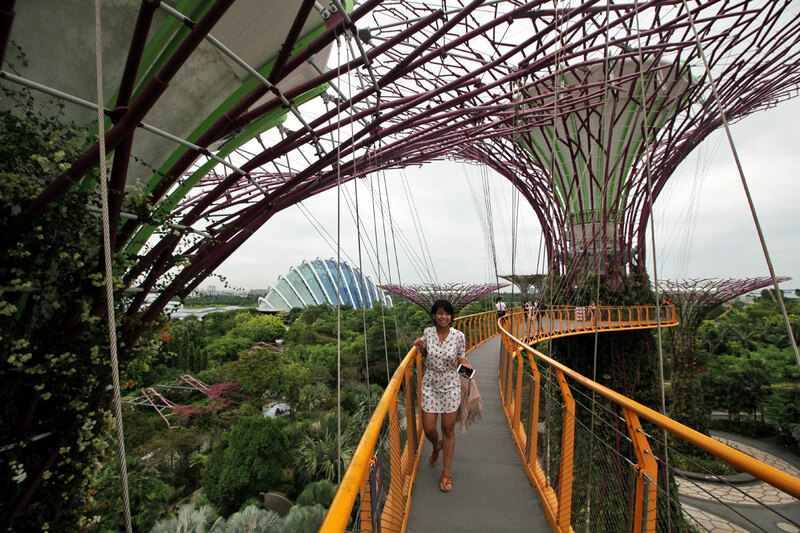 One of the things that surprised me most about Singapore was how green it was. 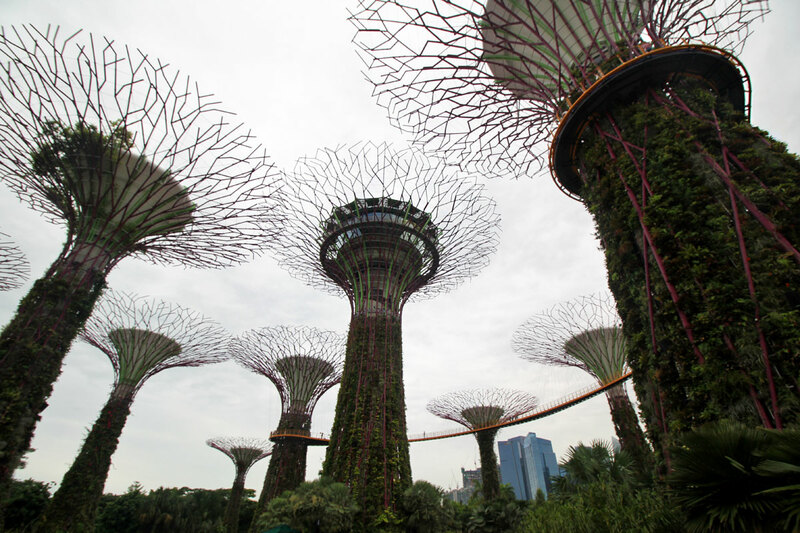 Despite being a small island nation where 100% of its population is urbanized, they actually grew their forest cover from 36% in the 80s to 47% today according to the Center for Liveable Cities. 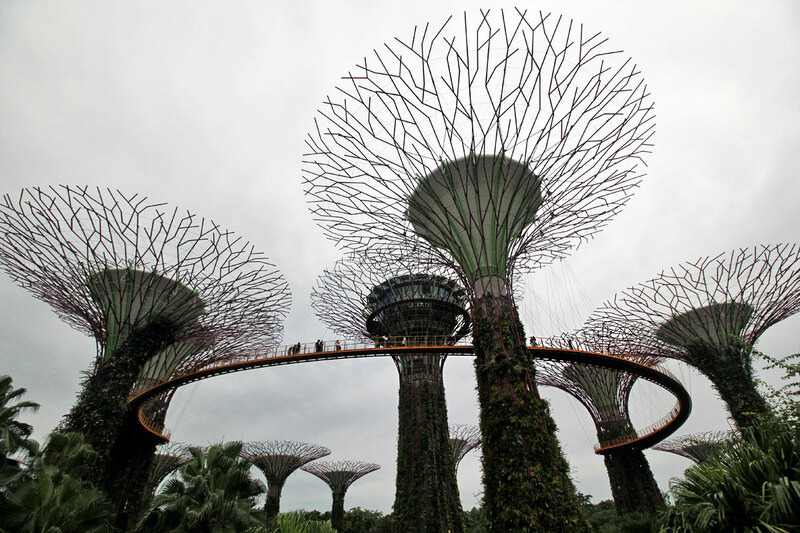 It seems Singapore has achieved an ideal balance between nature and progress and these Supertrees are the perfect example of that. Best of all, they aren’t just pretty sculptures meant to be admired but do nothing. Instead, they serve a function, a function that’s consistent with the city-state’s push to create lush environments, renewable energy, and future sustainability. 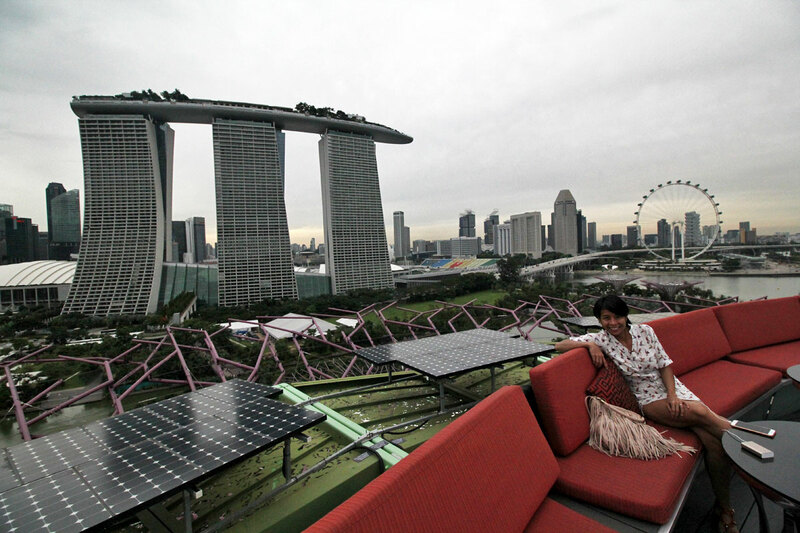 Singapore is the greenest city in Asia and one of its most progressive. 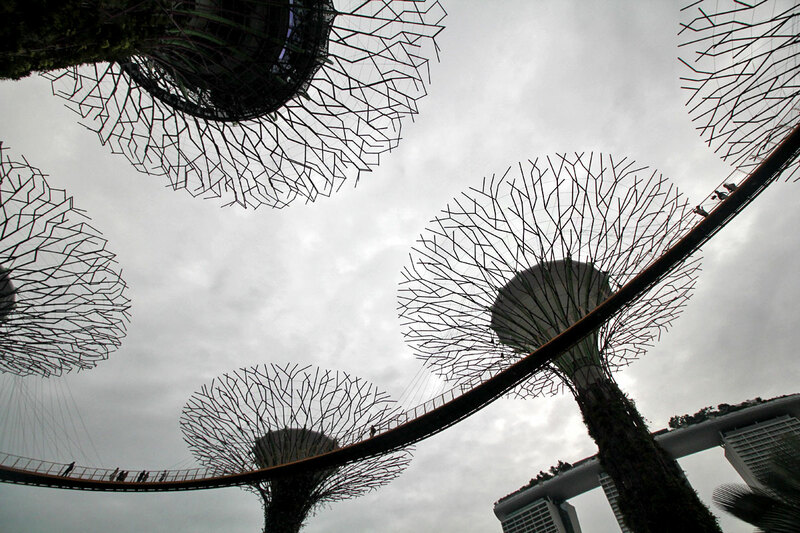 These Supertrees are a fitting symbol. 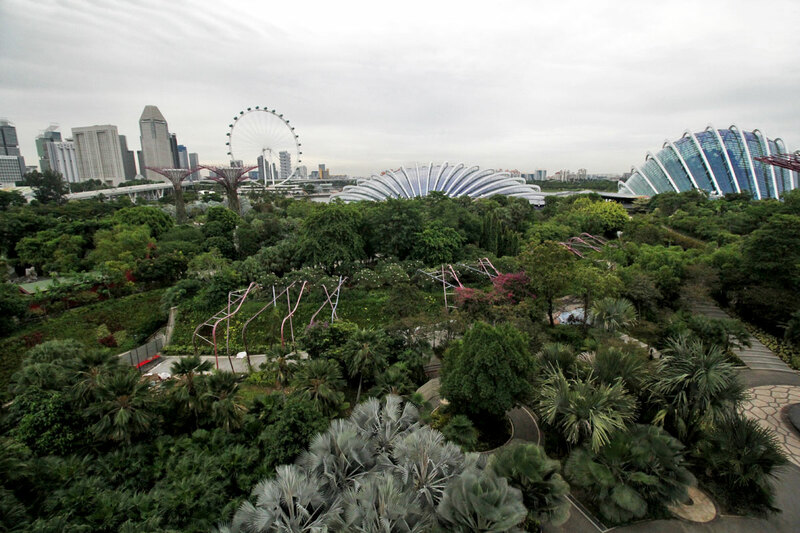 Before you go, be sure to check this page for Gardens by the Bay closure dates. They close the OCBC Skyway for maintenance once a month so plan accordingly.